Herpolirion novae-zelandiae is common native species found in subalpine and alpine sites in the central and northern mountains of Tasmania. 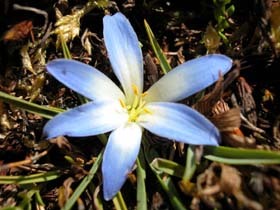 The plants are small, with a tuft of leaves usually about 2-4cm long and a few mm wide, and a single blue flower held on a short stalk above the leaves. They form mats in boggy places.